The history of the people of Routt County started before the advent of the first white settlers. Ute Indians camped in the valley as long as 1,000 years ago. During the summers, they migrated from Utah to hunt, fish and bathe in the healing waters of the many hot springs found in the area. By 1820, trappers had visited the valley, looking for beaver. They came but left no written trace. The discovery of gold at Hahn's Peak in 1861, the area's great coal reserves and the fertile valleys sheltered on three sides by high mountain ranges all led the way to the development of Routt County. 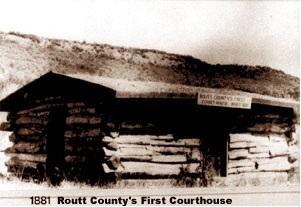 Routt County was created out of the western portion of Grand County on January 29, 1877. It was named in honor of John Long Routt, the last territorial and first state governor of Colorado. In the late 1800s, heavy wooden wagons, loaded with families and household furnishings, migrated west into the valley of the Yampa River and its tributaries. These first settlers came to ranch the rich, fertile valleys. They were soon joined by entrepreneurs hoping to find fortunes in coal. The 1909 arrival of the first freight train into Steamboat Springs opened the coal fields for production and a new era for this section of the state. Northwest Colorado was then accessible by rail and ready for development. New communities formed to serve those coming here to work on the ranches and mine the coal. For the first decades of the Twentieth Century, mining and agriculture formed the economic base of the county. The cattle, hay, lettuce and strawberries were key agricultural exports via railroad. The western portion of Routt County was split off to form Moffat County on February 27, 1911. Soon outdoor tourism began to be an important part of the local economy, based on the hot springs and Howelsen Hill Ski Area, which opened in 1915. The Mount Werner Ski Area opened in 1964.